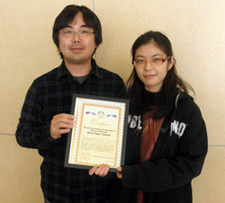 Prof. Kihara and Dr. Lee hold the Best Paper Award for their paper, “Improved protein surface comparison and application to low-resolution protein structure data”. Dr. Sael Lee a postdoc researcher along with Associate Professor Daisuke Kihara received the Best Paper Award at the 21st International Conference on Genome Informatics (GIW 2010). The conference was held December 16th through the 18th in Hangzhou, China. Dr. Lee obtained her Ph.D from the Computer Science Department at Purdue in August 2010, and is continuing her work as a postdoctoral researcher. The paper, “Improved protein surface comparison and application to low-resolution protein structure data” BMC Bioinformatics, 11:S2 (2010), presents a novel method for performing a real-time protein structure database search. The method applies the 3D Zernike descriptors, a mathematical series expansion, which was previously shown to be effective in comparing protein surface shapes by the Kihara group. They further applied the method for comparing low-resolution electron microscopy density maps. The related server for structure database search, 3D-Surfer, is available at the Kihara lab.